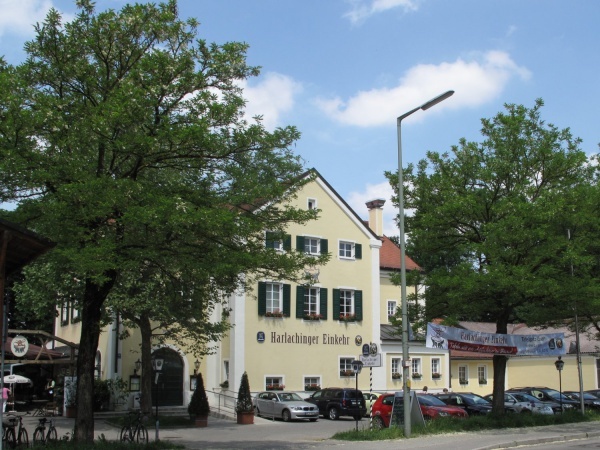 The Harlachinger Einkehr is located on a hilltop in Harlaching close to the Isar river behind Munich's zoo. In 1858, a prominent Bavarian landowner and banker, Baron Josef von Hirsch, ordered the construction of an inn across the road from the small historical church of St. Anna. In those days the beer garden was a popular meeting place amongst pilgrims. The property was partly damaged during World War II and refurbished by the Löwenbräu brewery in 1952. During the seventies and eighties the location became trendy amongst celebrities of that time period. Following several ownership changes, the Harlachinger Einkehr was refurbished and relaunched under new management in 2007. There are 700 seats in the self-serviced area and 200 seats in the serviced area. The kitchen and food stall offers a variety of traditional Bavarian meals at reasonable prices. The Steckerlfisch (grilled fish on a stick) is prepared on a charcoal grill. The Maß Augustiner costs €7.50 (April 2017). During happy hour between 4pm and 6pm and after 10pm the Maß price is down to €6.20 (July 2015). There is an open-air stage with regular live music events and major football tournaments are shown on a large screen. The beer garden is open during the summer months from 9.30am until 1am. Warm meals can be ordered between 11.30am and 11pm.